Found a new Marines blog this evening. 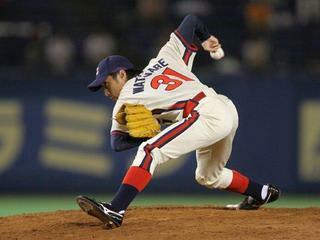 I didn’t even read the entry, I just like the pictures of Shunsuke Watanabe ptiching: particularly this one and this one. Orix Slugger Kazuhiro Kiyohara formally announced his retirement, on his 41st birthday before an away game against his first team, Seibu. 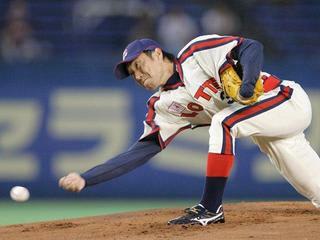 “I really appreciate being able to celebrate my birthday in my last season at Seibu Dome,” said Kiyohara. Chunichi Dragons relief ace Kazuki Yoshimi is doing a rehab stint in the minors and gearing up for a return to the top team. He went down with arm pain on July 21, and his return would be a boost the the Dragons. Yakult pitcher Dicky Gonzales made his first appearance in nearly two years on August 17, giving up 4 runs in 5 innings pitched. I’m actually a bit surprised that Yakult stuck with Gonzales, who is coming off elbow surgery. It’s a rarity for a Japanese team to show that kind of commitment to a foreign player. Yomiuri Giants outfielder Alex Ramirez has met the service time requirements for free agency. He’s under contract with the Giants for next year, so he won’t be a free agent, but he will no longer count against the foreign player limit. Ramirez becomes the third player, after Taigen Kaku and Tuffy Rhodes to shred his foreign player status under the service time exception. Hiroshima Carp Manager Marty Brown has returned to America temporarily due to the sudden death of his mother. My condolences go out to Marty and his family. Up next for NPB Tracker: an Olympics summary, a look at high pitch counts in Japan, and English-language blogs of NPB players.